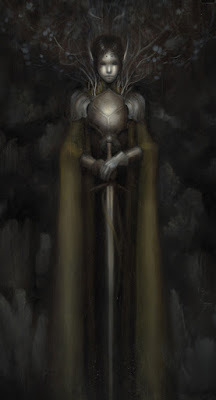 EPBOT: January Art Roundup: Owls, Elves, and Phoenix Masks! January Art Roundup: Owls, Elves, and Phoenix Masks! 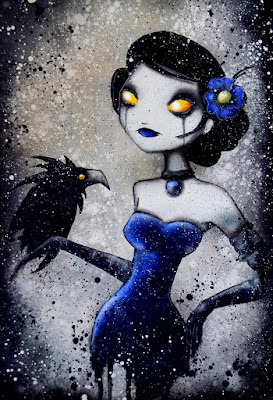 Time for more of my favorite geeky art finds! I skipped last month, so buckle up for plenty of eye candy. Anyone else thinking Secret of Nimh? Just me? Head over to Belak's online shop for prints, which range from $17-$22. Prints start at $25 in McKernan's online store, and there are LOTS more. Go see! Check out Panzino's Etsy shop for prints starting at just $8. Hard to tell here, but these are actually carved sculptures, and they look SO COOL up close. Look how gorgeous these are! The masks range from $50-$100, and Sell also sells (heh) some nifty dragon ornaments - so go check out her Etsy shop to see! And finally, it's simply impossible to pick just a few favorites from Alina Chau, because I keep finding more! I want to live in this painting. Those color fades! Ah! Head over to Chau's online store for LOTS more pretties, since I'm almost to the point of just cutting and pasting her entire shop inventory here. So be sure to mention in your comment if you like either/both of those (just say Fox or Travel) so I can enter you in the drawings for those, too! International entries welcome, and I'll announce my 3 randomly selected winners in my next post. Happy commenting! Fox and Travel Thank you for always finding awesome art to appreciate! Wow I love the beautiful Princess Leia. I am missing Carrie Fisher so bad :(. But this makes me so happy to see. Travel and wildcard! Plus I think I might need to pick up some prints from some of the incredible artists from this round-up. Wow, some lovely choices this month! Please enter me for the wildcard draw. Wow, those sculpts are fantastic! And two Tardis prints, whee! Please enter me for all the drawings! Some really amazing selections this month! Thanks, as always, for sharing. And please enter me in the wildcard draw, too! Er, I meant wildcard and TARDIS drawings. *blush* Thank you! Oh, I'd like any of the Tardisprints. My daughter's just moved out on her own, to the tiniest little student flat, she loves the Tardis and really, if anyone needs something that's bigger on the inside right now, it's her! Wow, the Vaughn Belak ones are amazing! But as always, everything here is awesome! I would love to be in the drawing for the Tardis Travel too :). Gorgeous art all around (as usual)! Please put me in for the drawing for either TARDIS piece. Wonderful art - all of them! Please put me in the drawing for Fox and Travel. Thanks!! Fox, Travel, and wildcard. So glad to see "darker" art and appreciation for it! Fox, travel, and wildcard! I'm in love with the darker pieces this month. Love those owls! And I'd like to be in consideration for everything, please! Wow, the stuff by Kelly McKernan is amazing! Love the travel TARDIS poster and the postcard called "All the Powers" by John Coulter. As always, thank you for sharing some amazing artists with us. OMGosh! 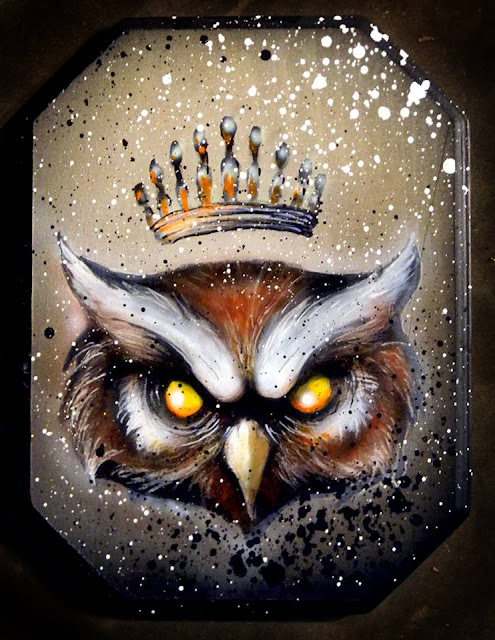 The Owl paintings just speak to me! 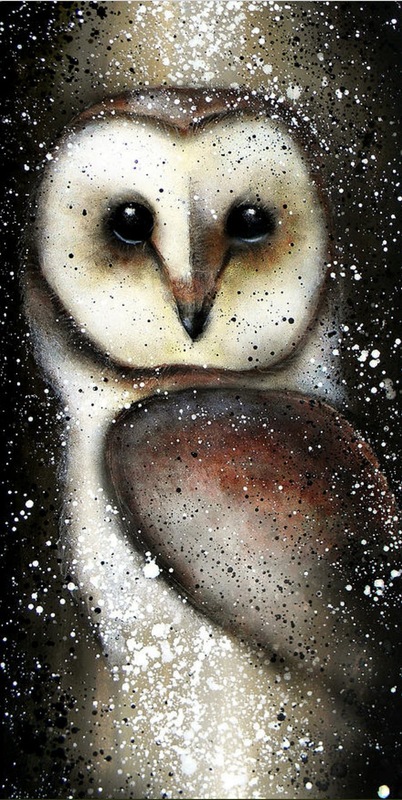 (My college mascot is the Owl, so, yeah)... and both of the Tardis paintings please. Thanks a bunch! I think this is my favorite at roundup yet! And I love the fox piece. Love both fox and travel! I love the travel and really all the pieces. The second Kelly McKernan one you have up reminds me of Stranger Things. Fox, Travel, or any other Doctor Who art. 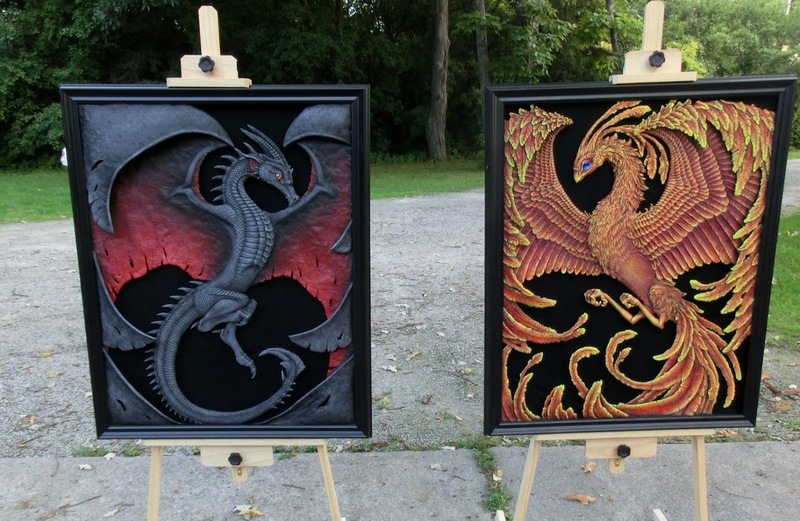 :D My 12yo is going to flip over that 3D dragon art! Love the round-up this month, especially all the darker-toned pieces! Fox or travel and they are all wonderful, the owl print makes me think of Alan Garner's 'The Owl Service' book. I love both tardises! Please enter me for both :) Great art overall this month. Such pretties! You always pick such wonderful artists to showcase. I would like to be entered into all three drawings please and thank you. It's a new year, maybe I'll get lucky. Fox, Travel or anything else. Love all the items you find. All Hail the General! Please enter me in the wildcard. Please enter me in the wildcard and the fox and travel! Thank you! Thanks for all the suggestions. Please throw me in the TARDIS drawing as well. Fox and Travel and thank you always for scouring the Internet for pretties! Ooh, that fox print... I'd love the fox print! Or any print! You find the coolest stuff! Love that Tardis travel print! I love your art roundups! Love, love, LOVE both Fox and Travel! :) Art Roundup is always cool! I'd be happy to win Fox, Travel, or anything! More great choices, I saw Chau's booth at Dragon Con, but because I take so long to choose anything I grabbed her business card to look over her stuff later. I ended up framing the business card because it was so beautiful! These are all so beautiful! Please enter me in the wildcard, fox, and travel drawings. Thanks! Oh! I've been looking at both the Fox and Travel for a while thinking they would make great gifts for my sister-in-law. I have three frames I need to fill and every month at your art round-up I think "oh I should go with that theme/artist" but they are all amazing. So much indecision. Enter me for all three please!!!!! Doctor who is definitely my fandom but I love everything on your boards!!! Fox or Travel.... 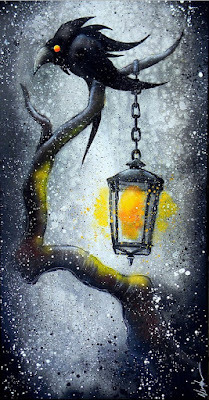 I love that you find pieces I can fall into a daydream with for just a moment but feel so refreshed after. :-) As always, thank you for sharing. Love the art you find so much. AND LOVE THE FOX TARDIS. So sweet. amazing as ever, and TRAVEL! The Pan's print caught my eye too. Love the music from that movie. I would love the chance for one of the art board give aways. Such good goodies! 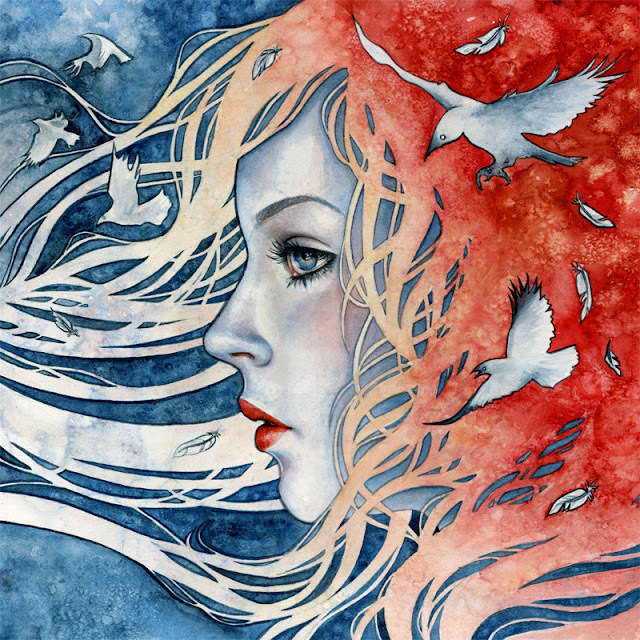 My favorite piece this go-round is the beautiful redhead by Kelly McKernan. So incredibly gorgeous! Please enter me for all three drawings. I guess I'm leaning slightly more towards the Travel poster. Fantastic stuff, as always! Anyway, please enter me in for everything, because I would love either or both of those Tardis prints! Once again, a wonderful showcase of some amazing artwork! I'd love to be entered in for all 3 giveaways! I love both fox and travel! These are so fantastic. I'm going to head over to Alina Chau's page to see if I can get a piece to give as a birthday gift. I have two littles (5 and nearly 3) and I hate giving toys to their friends on their birthdays, because I know parents don't really like all the extra toys around. So I'm going to start giving art! Well now I'm kicking myself for finally going and looking at your Pinterest board. There would be NO WAY I could pick just one. I'm now analyzing my paycheck to see how many of those prints I can actually afford.I'd love the FOX print. Travel by Tardis! 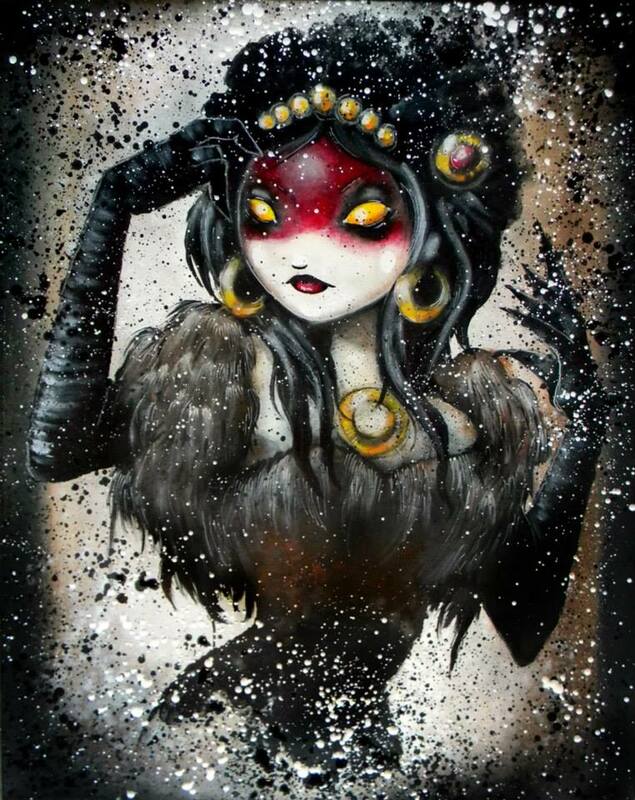 Your art roundups are seriously hard on my budget but I love them so much. And I collect travel posters of fictional places and methods of travel! Fox, Travel and all the rest! I bought some art prints for Christmas presents from Bianca Roman-Stumpff and they were a HUGE HIT. Thank you for making my Christmas shopping LOADS easier!!! The owls are AMAZING! And I love both of the Tardis prints, especially the travel one. Travel! I love it, makes me want to take a vacation, and traipse through the universe! 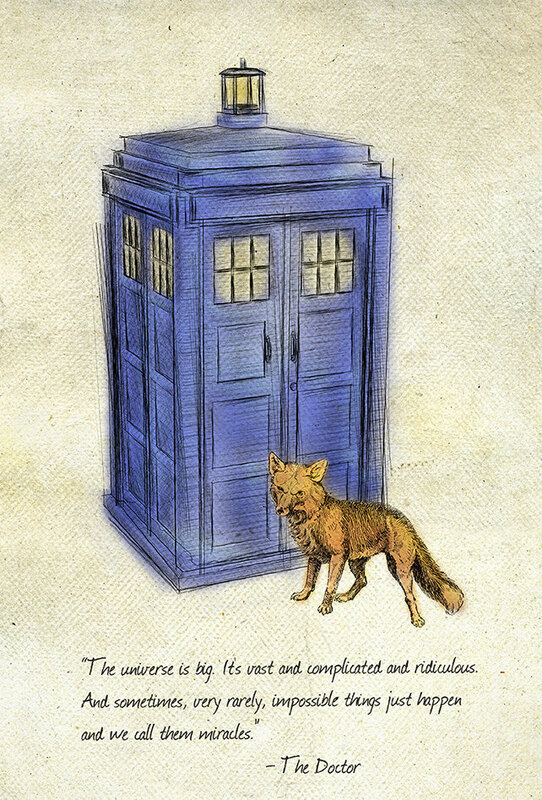 I love both of the Tardis prints, but the fox one is just so very pretty, and I love the quote! 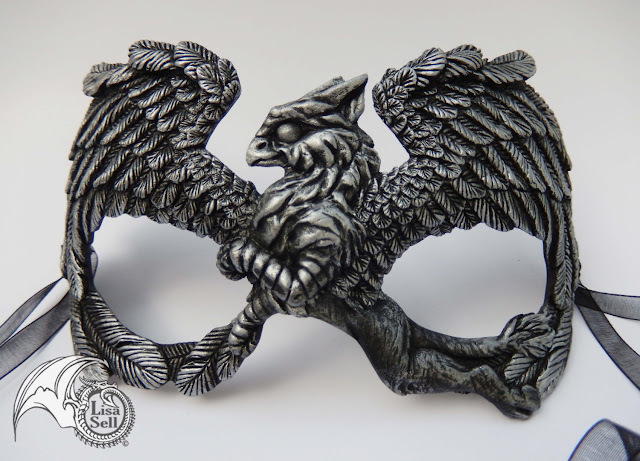 Also I audibly squealed at my desk at that gryphon mask; gryphs are seriously under-represented in fantasy art! Fox and Travel are both great! Love your art roundups. Thanks so much for doing this. Don't have much to say, too tired from baby, but my toddler would love more Star Wars art. Those dragon masks are so cool! Nice roundup, as always. Fox and Travel please! 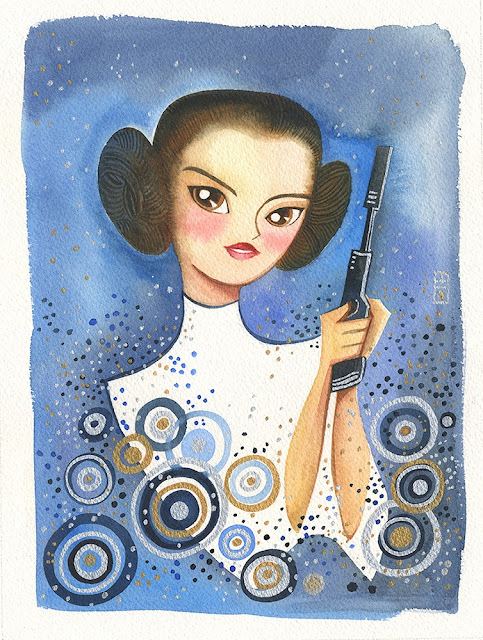 I love the Princess Leia print. I've been drooling over those Tardis pieces in your inventory for years, always top of my list. You have great taste Jen! All the prints are beautiful! Fox for the wildcard, please! I really enjoy your taste in are. Thanks for sharing! Fox and Travel please. Fox and Travel, for my son, who is a DW fanatic! Thanks! I'd love to be entered for either/both of the Tardis posters! So cool. Ooooooo, the travel TARDIS poster, please! Sigh.....not enough wall space for all the things you post that are so cool, but on the off chance you pick me, I'll find room for the TARDIS! That owl print is stunning. Love them all! I love that mask! And, of course, the Fox and Travel posters. Those are all so neat! Fox and travel too, for me. Oooh, Fox and Travel both, please! Even the wild card would be great. You have such an interesting eye for these things. Thanks! So many pretties! I especially love the travel TARDIS! Those owl prints are awesome and those masks are amazing! I would like to be entered in to the wildcard draw, and for Travel too! fox! travel! or anything really! you have such awesome taste! As usual, you show off some amazing work. That Dr Who Travel poster is fun! *swoon* They're all so beautiful! I love art roundup time. Please enter me into the Tardis Travel drawing! The owls are so cute! And I love both the Fox and Travel Tardis prints! The owl with Belaki did does look like The Great Owl! 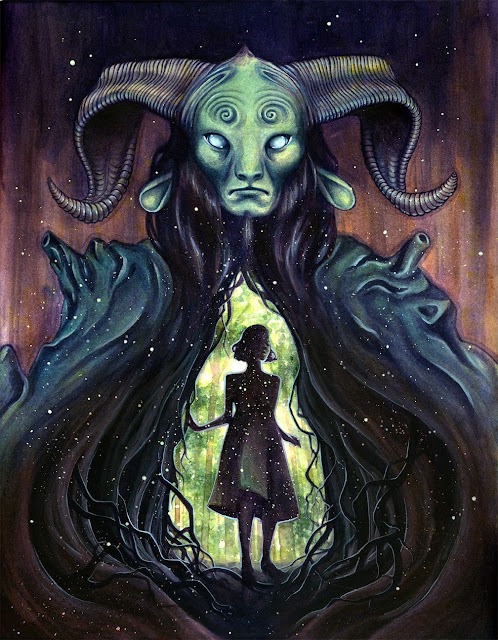 And I love Kelly McKernan's Pan's Labyrinth! 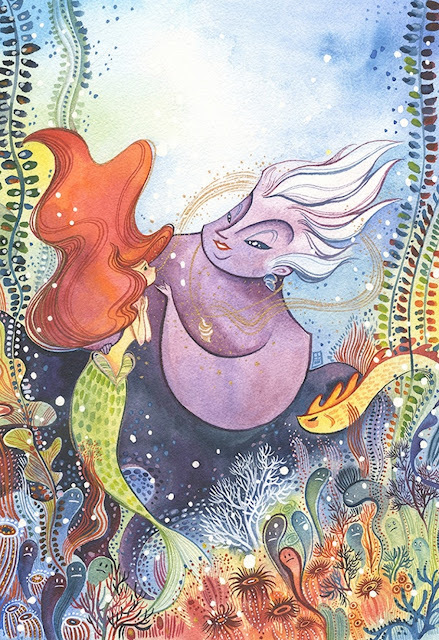 I would like to be entered for the Fox please, and if picked for Pinterest, I absolutely love the Fantastical Coloring Book Volume 1 by Jessica Feinberg. And if it's a anything else, surprise me! I love everything and don't like narrowing my Geek scope! I'd love either TARDIS. :) Sells dragons are amazing! Thanks for sharing those. I was so thrilled at a Kansas City convention to see some artists you've covered in your posts. I'm sure they didn't understand why I was so excited :p But they appreciated my money (and I was certainly set for Christmas presents). Both the TARDIS prints are fabulous! Wow, Alina Chau's stuff is amazing! I'd like either of the Tardis prints! The Nathan Szerdy 😍😍😍 I die!!! Please enter me in the art drawing! And I'd like either or the Travel Tardis print if I get picked! Love all of these! Please enter me in the Fox, Travel and Wildcard, thanks! My first time trying for one of these... I'd love Travel, and failing that, the wildcard. I think I say this every month, but I'll say it again - these are my favorite posts on the internet! Beautiful, as always. I'd love to be entered in fox, travel, and Pinterest, please! Oh i would love to live in the Legend of Zelda print as well!! So many beautiful colors. Wild Card me please! Fox and Travel - Those would be fantastic for my new nephew's nursery! Ooooh, those masks are stunning! I was staring at the dragon for ages already loving it without realizing it was a mask until I actually read your comment above it. So cool!!! I'd love to be entered for the general drawing and the Travel poster. Thanks! Fox! I love the quote and the style. :) Sorry if this was asked before, but do the artists ever tell you if there's an uptick in sales after being featured on your site? I know that, thanks to you, I've bought a few pieces I wouldn't have found otherwise. Those are some very pretty pretties, but none of them are my style this time. However... TARDISES!!! Both, please! Love these - especially the travel poster! Pinterest give away please and thanks! Both tardis pix are awesome and i would love to pic a pic for my husband for vday. I love looking through all your finds. You have beautiful taste. The Tardis prints are awesome, but the FOX is what sings to me! Love them all, as usual - but Leia! And test, please for both fox and travel! Fox and Travel! Sounds like a proper British pub, doesn't it? I'm a fan of the Doctor and would love to show that with either of those. Thanks a bunch for giving us the chance to! I'd like to be entered for all the giveaways! Oh, I love to see your art picks. I don't have time to get lost in this kind of stuff, but I do enjoy what you show us. I would love to be included in the Tardis posters giveaway. I love the fox one, but the other is also fantastic. thanks!!! And I love the Travel and Fox pieces too! OMG, Alina Chau's work is adorable. Also, travel! I love all of the colors on Chau's work. It just works without being obnoxious. Travel, please! Thank you again for an amazing roundup! I want ALL of those owl paintings. So pretty. 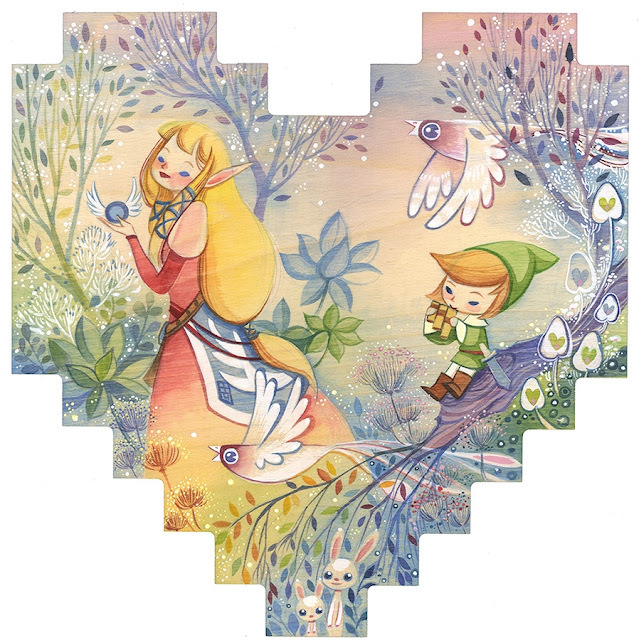 I love the Link and Navi print, but so many good choices. Please also enter me for both of the bonus giveaways. Fox and Travel - both!!! So many good ideas for artwork for the geeky nursery we're putting together!!! Thank you for sharing all the shops!! Fox and Travel. These are lovely! Please the fox and travel! I have been eyeing those forever. Holy cow, love the travel TARDIS poster! I love the little mermaid print. Sooo cool. Also, I want a carved mask. Awesome. I won reccently but feel free to enter me in everything. Still got lots of wall space in my doctor who bathroom. Oh. Oh, my... Lots of pretties this month! Both Fox and Travel are amazing. And I so love the NIMH owl. Yes yes yes. Travel! I think that poster is my favorite art piece I've ever seen on this site. It would look lovely in my office in my first home that I just bought and quite possibly inspire me to write a fantastic novel which, when published, I could give away to lovely Epbot readers! Travel and wildcard please! Thank you. Love the Travel poster. It's so fun and I can hear a radio announcer reading it when I look at it. I always hope that this round-up will be my lucky day. Also, please count me in for the fox! Fox, travel and wildcard ^^ . This month roundup was really nice. I might go get myself some prints from some of those artists! Fox! No... travel! No... fox! Gah! So much beauty! Love them both! Loving the art inspiration in general. Especially the pans labyrinth piece. It just does something to my soul. Fox and Travel Tardis are both lovely! They're such fabulous Doctor Who delights. Yes to all! Your art posts help us to discover artists to look up with we go to Cons! Thank you! And I love the Fox one! I'd be happy with the fox tardis print...but really, I still long desperately for art nouveau wonder woman. I'd buy it if Nathan ever sold on line or came to a con I was at, or if your Pinterest board was for sale! If anyone ever does win it, I will probably actually cry. I've actually saved a specific wall space for her, even! Fox and travel are both lovely! Fox, travel & wildcard... love the art this month! These are always my favorite posts! Fox and/or Travel, wildcard... How exciting! I love both the Fox and the travel prints! This is some wonderful artwork! Every month I look to see if my favourite art is still here and cross my fingers in the hope of winning it. So here I am as usual. Like the Fox and Travel art as well. Travel and wildcard, please (and thank you!). 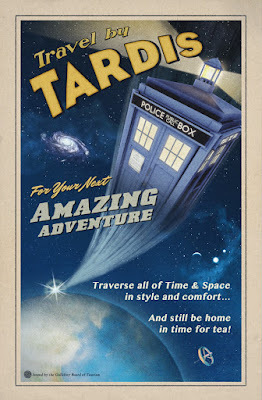 I love the TARDIS travel poster! 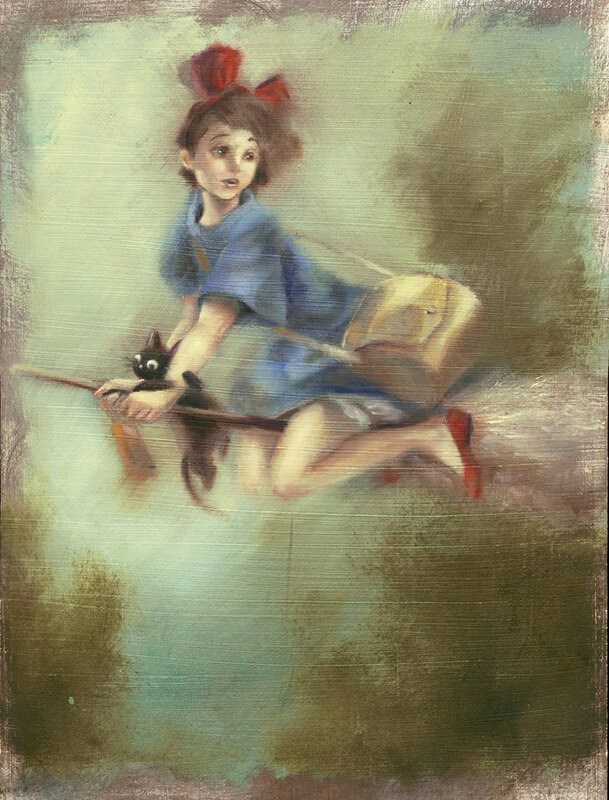 My fave of the others is Kiki's Delivery Service, one of my most loved movies. I was just at the Studio Ghibli museum outside Tokyo last Saturday. A highlight of an amazing trip. Also, I never considered sculpted resin masks. Those are incredible. Wildcard and I would love either TARDIS print. 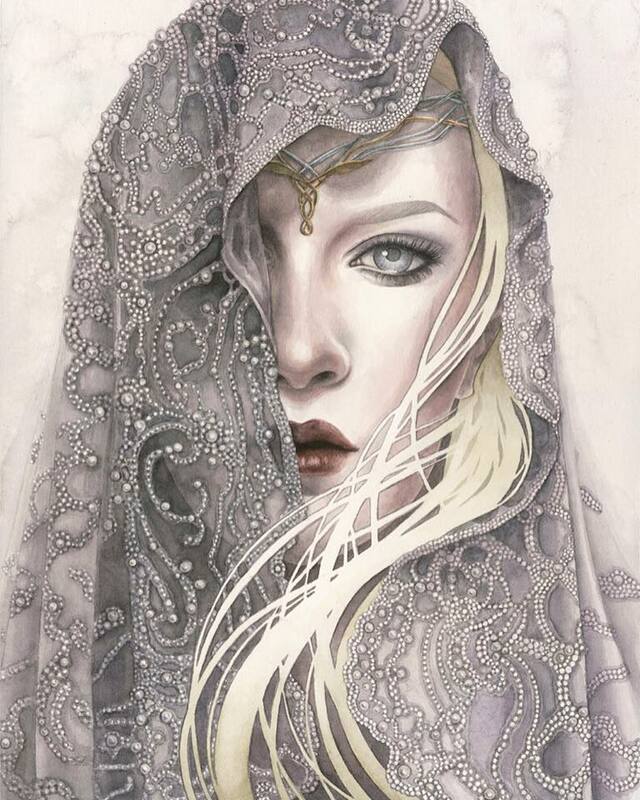 I'm checking out Kelly McKernan's site now, her stuff is beautiful, thanks! Really digging her Pan's Labyrinth. They are all so beautiful. I would love to be entered for the TARDIS/fox ones as well. Fox and Travel! My granddaughter's nursery is vintage fantasy travel themed! We have a Hogwarts poster, and a whimsical world map. A TARDIS would fit right in there for my grandnerdling. Love you guys and all the support you have sown amongst your followers and tribe. Ooh! I love the Art Nouveau Wonder Woman by Nathan Szerdy and the signed Supergirl print by Patrick Thomas Parnell! I also like either Doctor Who poster! I posted and it came up unknown for some reason...but I still want the Samus print if I get picked, haha. I love all of them! Please enter me for Fox & Travel! Oooh, I'd love to win any of them! Always amazed at the amount of talent in this world. Wow. 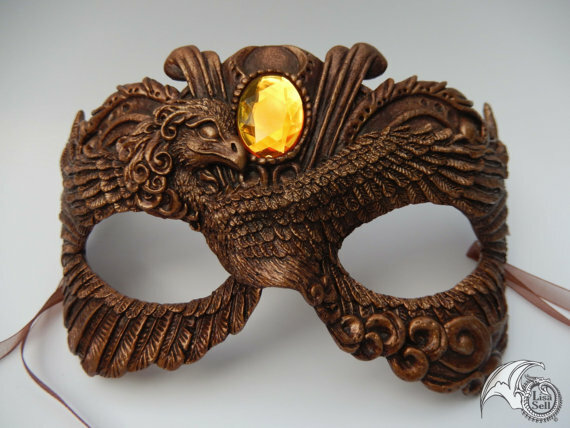 Those dragon masks ::swoon:: I need that Tardis travel and fox prints in my life! Love nerd art!!! Please enter me for the TARDIS travel poster as well. Thanks! My 14 year old son would love either of the TARDIS prints so please put me in for both Fox and Travel as well as the wildcard. Thanks! Ooooh have just looked through the pinterest board, how have I never seen it before?? I am in love with the wonder woman print! I love your dedication to sharing pretties from artists!